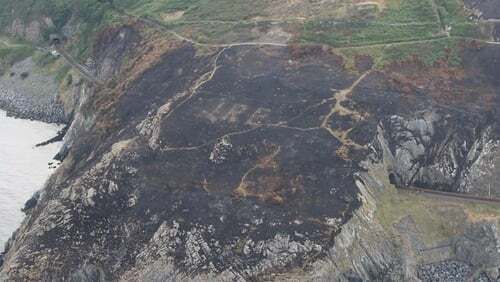 A recent gorse fire on Bray Head in Co Wicklow has revealed an ÉIRE sign which dates from the Second World War. At the time, the signs were carved into the ground by local volunteers. The discovery was made by a Garda Air Support Unit crew. A spokesperson said: "The signs themselves are quite common on the west coast but unusual on the east. "The Air Corps helped put the fire out and then the Garda helicopter, which we fly, noticed the sign emerging from the past." Up to 150 tonnes of stone were used in some of the 83 signs dotted around the coast of Ireland. At the request of the United States air force the number of the nearby lookout post was added, turning the signs into air navigation aids. This assisted American bomber pilots in navigating across the Atlantic.